We use various devices to manage precision and provide high precision treatment. The CHECKMATE -1091 is a dosimeter with an open parallel plate ionization chamber used to measure the dose irradiated by the Novalis. Dose measurement is performed every morning before work starts. The radiation dose irradiated by the Novalis is measured by a high-precision dosimeter. Dose measurement is performed every week to ensure that the dose calculated by the treatment-planning device is irradiated accurately. 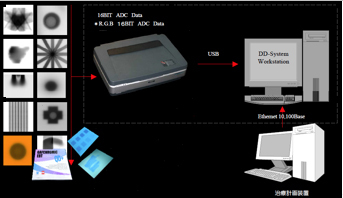 dd-System is a device used to analyze the distribution curve of the dose irradiated to radiotherapy film. Our clinic checks the dose distribution curve of the film for each patient. We do not need an automatic developing machine. We use GAF chromic film that shows an image right on the spot when irradiation occurs. 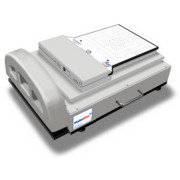 The MapCHECK is a system that lays out 445 semiconductors two dimensionally to measure the dose distribution curve just like the dd-System (3). Our clinic always double-checks using the dd-System and the MapCHECK. This is a state-of-the-art system that can simulate and check tumor movement using an XY table designed exclusively for MapCHECK to eliminate errors associated with respiratory displacement of the tumor. Before treating the patient, a phantom measuring instrument is used for simulation. The detector of the high-precision dosimeter is inserted in the phantom to confirm the radiation dose to the tumor. Radiotherapy film is inserted to confirm dose distribution via the dd-System. Our clinic carries out treatment planning using the iPlan treatment planning device designed exclusively for Novalis. In order to check treatment planning via iPlan, we use the Xio three dimensional treatment planning device used for general linear accelerators to calculate the treatment dose as a double-check. Our clinic has a service agreement with the device manufacturer for comprehensive quality management of the Novalis beam and confirms once a year that there have been no changes in the beam characteristics.